There was a time when the rage that boils inside Grimlock would have driven him straight to the ranks of the Decepticons. But while his flawed manner of speaking may make him sound strange, he's smart enough to recognize a bully when he sees one - and Grimlock doesn't like bullies. It's this that fuels his dedication to fight against the Decepticons. Who can forget that line? Dinobots are fan favorites, much like the Insecticons. Everyone wants them in the toyline regardless if they fit the continuity or not. As for the character, G1 Grimlock and the Dinobots were obviously the �Hey we can make transforming dinosaurs!� part of the line. Their G1 cartoon backstory left a lot to be desired, so thankfully the minds behind Fall of Cybertron envisioned an entirely new backstory involving a sick experiment by Shockwave. This version has at least some decent reasons that the Dinobots looks like dinosaurs (Shockwave saw them through a space bridge) and Grimlock�s inability to speak in full sentences (broke free of mental conditioning). 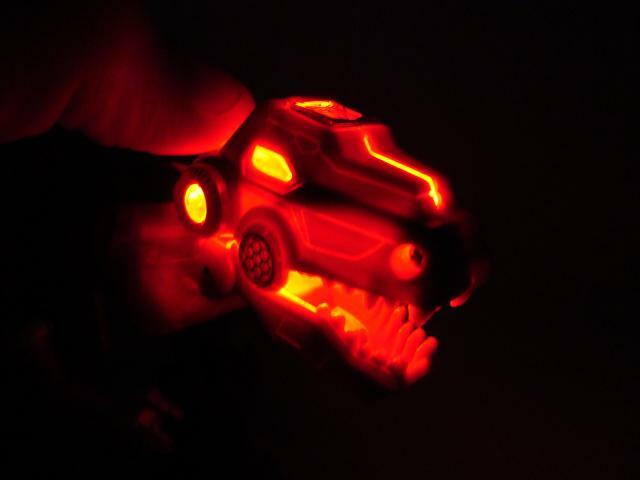 So now, everyone�s favorite simple-worded T-Rex is back in action with a new toy. 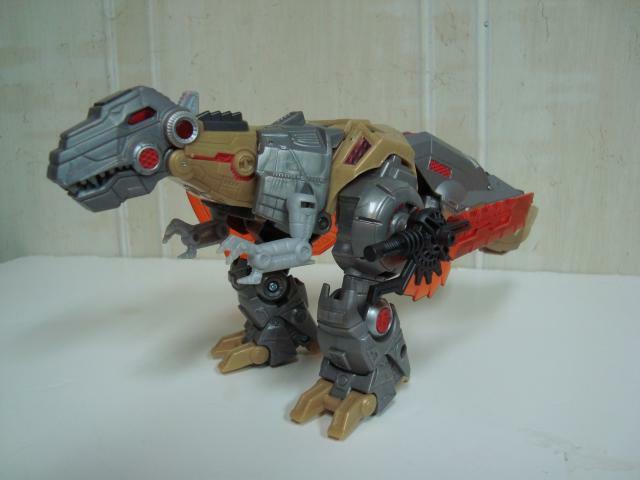 Not that Grimlock has been absent in recent toy lines - quite the contrary. The big bad T-Rex has been in several new lines including Animated, Classics, and Masterpiece. For the most part, King Grimlock has been featured as a Tyrannosaurus Rex, with a few exceptions like the Ford Mustang GT (Alternators), a construction steam shovel (RiD, also a Decepticon), Velociraptor (Armada), and a tank�. thing (Titanium War Within). Does King Grimlock the T-Rex make a triumphant return to toys? 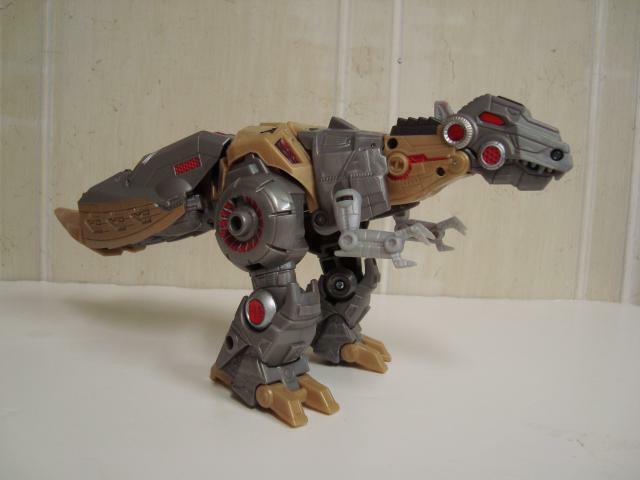 As typical (mostly), Grimlock�s alternate mode is a Tyrannosaurus Rex. This version is based on his Fall of Cybertron appearance, and for the most part, it�s a fair representation of the mode. Aesthetically, Grimlock hits all the necessary points: silver for the majority of the coloration with gold highlights on the toes, tail, back, and neck. There are also some red highlights on the entirety of the T-Rex mode, mostly around the joints and on other small parts of the main body. There are minimal black/dark grey highlights found, but overall the color palette has enough variety without looking too scattered, while retaining a decent similarity to the CGI model. 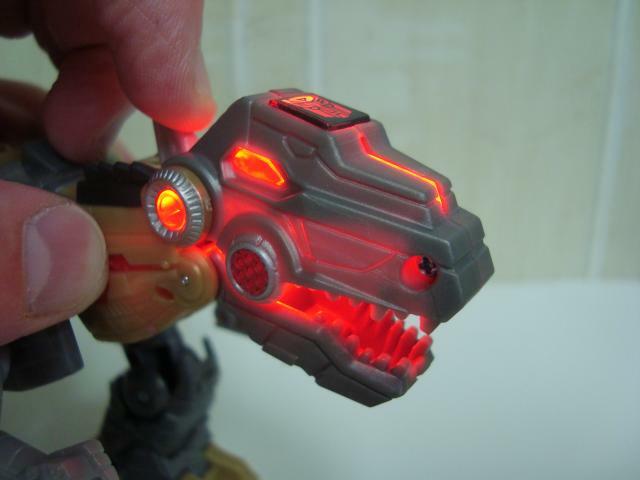 As for gimmicks, Grimlock�s head lights up nicely when the small button/fin near the back of his head is pulled, revealing a glowing mouth, eyes, and Autobot symbol in the head. The glowing head is rather spectacular in low light. It�s a fun feature, but I wish there was a way to lock it into place since the jaws are closed otherwise. Anther feature common with recent Transformers is the ability to peg his weapons into his hips for storage. It looks quite dumb, but the alternative is having them sit on the floor next to him. Well, that pretty much rounds up all the fun features of the T-Rex mode. I�m sad to say this mode is really quite disappointing. Here�s a summary of articulation in T-Rex mode: the jaw, knees, and arms move. Done. Sadly, the hips are locked into place in his traditional transformed mode. I�m sure you can unlock them, but the hips become rather floppy and don�t add much to poseability. Aesthetically his tail is atrocious. The legs snap together to make up the tail, which ends up looking incredibly thick, somewhat stubby, and immovable. The underside of Grimlock is very hollow; there is nothing to cover it up, so it looks like he has a gaping ribcage underneath. Overall the T-Rex mode is disappointing, but at least the Voyager class puts him in good scale with the other Classics-type figures. Robot mode is a bit better than the T-Rex mode, in my opinion, and Grimlock looks rather imposing. His chest and shoulders are quite bulky, and he�s very tall in this mode � he is about a half-head or so taller than Classics Optimus Prime. The head mold is done well, and I think it�s a good update to the Classics-type look. The waist is a tad skinny, but overall the whole design aesthetic is well crafted. The detail is well done with panel lines, red, gold, and dark grey highlights in various spots. As a nice touch, there�s a modified Autobot symbol on his chest, which has quite a dino-look to it. For articulation, Grimlocks shoulders swivel in a few different directions, the upper arms, elbows, and wrists all move as well. The head is on a ball joint, allowing for a wide range of motion, and the hips, thighs, and knees all have articulation. Missing is any movement in the ankles, which can lend to some balance issues in wild poses. He�s solid when standing upright though. For gimmicks, the light-up mechanism works here too; press the same button as before (now on his back) and the chest cavity and �Dinobot� symbol lights up. This works OK, but if the jaw doesn�t open well, the lights are rather dim. 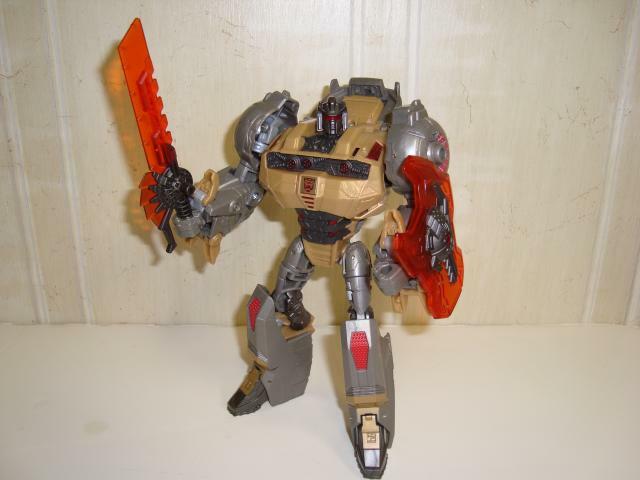 Grimlock also comes with a fantastic sword and shield, beautifully molded from clear orange plastic. The detail on these are great, and they are an excellent addition to the figure. As for the downsides to this mode, the back is still kind of hollow � the T-Rex head and neck are tucked in back here, and don�t lock into place. The backs of the lower legs are also hollow, which is great for making the tail, but very bad for weight distribution. Grimlock is rather top heavy, and balance is problematic in a good chunk of poses. The worst part of this figure has to be the shoulders. The design is poorly done, and I feel like I will snap them at any point during transformation. They�re quite floppy, and the ratchet joints on them are very stiff. Combine that with the lower quality plastic seen in several recent figures, and you have a potential recipe for disaster. I haven�t noticed any stress marks on mine yet, but I fear over time, something is going to break. Overall, I think Grimlock is a good figure in robot mode, and somewhat passable in T-Rex mode. I wouldn�t go out of your way to track him down unless you�re a heavy Dinobot fan, want a new �in-scale� Grimlock for your Classics collection, or are a completionist for the Fall of Cybertron figures. However, if you have the cash and think he looks good, he�ll be worth consideration at normal retail. Transformation Design: 5. Middle of the row here. Not awesome, but not hair-pulling. There just isn�t a lot of pizzazz in this one. Durability: 6. The plastic quality has decreased in recent times, and I fear the wonky shoulders will break every time I transform him. Fun: 7. OK, so he has a sword, shield, and lights. Balance issues hinder some of the fun, as do unmoving dinosaur legs. Aesthetics: 9. Standing still (and from the front) Grimlock looks awesome. Finally he�s bigger than my Classics Optimus Prime, and the T-Rex mode is just as big and awesome. Articulation: 6. In robot mode, Grimlock has a decent amount of articulation. No ankles = hard to pose. As a T-Rex, only his jaw, knees, and arms move. Value/Price: 7. At $23 USD retail, he�s not too bad. Had he been a better toy this would easily be higher. Overall: 7. Grimlock is above average, and looks great on display. As a toy he falls flat in several areas.